Speech on How to make a Sand Castle? Good morning respected principal and teachers and greetings to my peers and fellow students. Today I am going to put forward before you my speech on how to make a sand castle? Sounds interesting right? 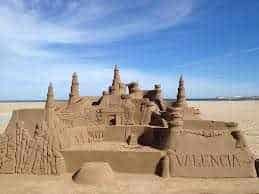 We have all seen pretty pictures of sand castles either in movies or on the internet. It seems quite easy to build one. But let me remove one misconception about it. It is not at all easy to build a sand castle at least for me it was tough. At the beginner level it will be better if you start with a simpler one. The three things that you need before building a sand castle is-sand, water and equipment’s. Sand is such a material which disintegrates easily. Since it made up of a large number of big grained particles hence it adhesive property is very less. It doesn’t maintain its shape well. It is impossible to work with dry sand. Wet sand is workable. To work on sand, you have to make sure it’s wet only. Near the beaches you usually get fine grained sand which is easier to work on. Big grained sand is almost unworkable. The trial and error method or recipe for  sand castle concrete mix is one part of sand to one part water. We have to pour the water in the big bucket first, then shovel in the dry sand for easier blending. Sand castles will be broken one day or another. But we have to make sure that one that we build doesn’t get washed off by water immediately. Hence it is better if you build your castle a bit away from the waters. But not so much away that the sand becomes dry. You have to be in moist sand but away from waves. That is the best spot for your sand castle. For a sand sculpture you need proper tools firstly. A small spade, a small bucket, a towel, some shape makers if needed. Start by digging a hole and gathering a lump a sand. Start building the castle by building a square foundation. Make sure is firm and doesn’t break apart easily. Finish off the uneven edges with the back side of the spade. Fill your bucket with sand up to the rim. Pat on the top to free it of gaps and air spaces. Try to make it a one solid piece. Now bring the bucket on top of the foundation and turn it upside down. Let the sand fall out of the bucket as one single piece. This is the main body of the castle. You can now style it in your own way by adding walls, poking holes in place of windows, digging out a shape in place of a door. You can make the roof according to your choice. You can make a pitched roof or a flat roof according to your choice. For a conical roof take pinches of sand and start heaping it on the head of the castle. Keep heaping until it forms a big conical mass. Start making the heap plain with your palms. Be careful not to apply too much pressure or else the entire mass will collapse. Once done add a little twig tied with a cloth at the top to signify flag of the castle. Or you can decorate it in your own way by adding tiny clothes or articles or sequins. At the expert level comes in a few more tools, like the carving tools. Carving tools are something which you can easily find lying around your household. It can be a pen knife or a pastry cutter, refills of pens, broken blades, used brushes. After the castle is complete you can use these equipment’s to add an extra bling to your castle. Some Artists even mix adhesives with the sand water mix to hold the sand castle rigidly together. Adhesive mixed sand is easier to work on too. Carvings can be easily done on such sands. With more expertise you can start building bigger and better castles. Sand art is an art which if developed properly can become one’s profession. With more practice you can build bigger castles and more intricate designs. Nowadays sand art is becoming an increasing craze among the artists. But it’s sad to see that such brilliant works will ultimately get blown off in the seas. I think steps should be taken to preserve such art. They will form an example for the future generation.